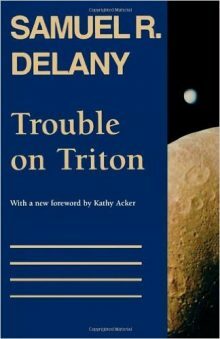 In a story as exciting as any science fiction adventure written, Samuel R. Delany’s 1976 SF novel, originally published as Triton, takes us on a tour of a utopian society at war with . . . our own Earth! High wit in this future comedy of manners allows Delany to question gender roles and sexual expectations at a level that, 20 years after it was written, still make it a coruscating portrait of “the happily reasonable man,” Bron Helstrom — an immigrant to the embattled world of Triton, whose troubles become more and more complex, till there is nothing left for him to do but become a woman. Against a background of high adventure, this minuet of a novel dances from the farthest limits of the solar system to Earth’s own Outer Mongolia. Alternately funny and moving, it is a wide-ranging tale in which character after character turns out not to be what he — or she — seems.